I was so excited to finally have the chance to try making bouncy balls with the boys. It was a fun (though messy!) science experiment and we learned a lot. We read a few different blogs on making bouncy balls and finally began assembling our materials. I'd also recommend latex gloves-- we had some blue hands for a bit! In our bowl we mixed the warm water, borax, and paint until most of the borax had dissolved. Then we measured our glue and poured it into our paint mixture. The glue immediately begins clumping up and after a few stirs we scooped up the glue and began pressing it into a ball. Occasionally some glue would squeeze out in a few places and if it the ball became sticky we'd roll it back in the water/ borax solution. These did bounce pretty high. Alec accidentally bounced it right back into the bowl of painted water and I had to go change and wash my WHITE shirt while he cleaned up the table and floor. After that I advised them to bounce them on the floor and these balls usually bounced back up to their waists. Here you can see the glue clumping together. We tried a second batch using tempera paint and while we might not have used enough glue we had a very hard time forming a ball with our second batch and couldn't help wondering if the paint was just too thick. 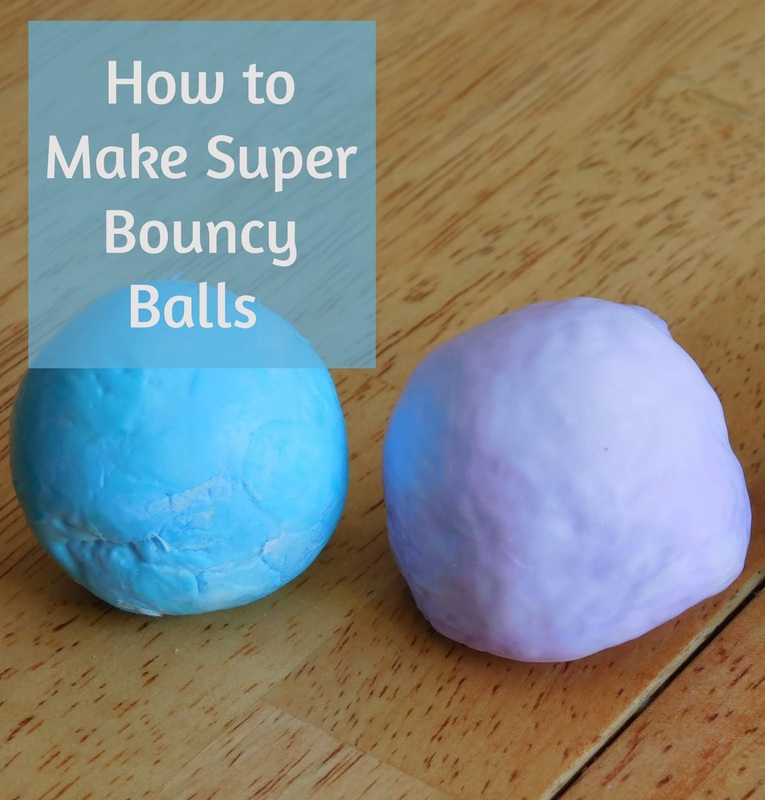 Basically the balls are a very firm slime mixture and we had read many warnings on most "how to's" that the balls will loose their shape if you leave them sitting. You can reshape them until they dry out so it's recommended that they be stored in individual Ziploc bags. I can't really say though since my boys played with them for quite some time and then just decided to throw them away. Sounds like it was a fun experiment. It was a nice change from slime and they did bounce pretty high. Bummer... can you get liquid starch or I've heard contact solution works too but you'd have to play around with the amounts.